What do we understand by social change? How do we understand groups & communities? How do we define participatory communication? with communities that are experiencing and shaping processes of social change? ​can own, access and control? 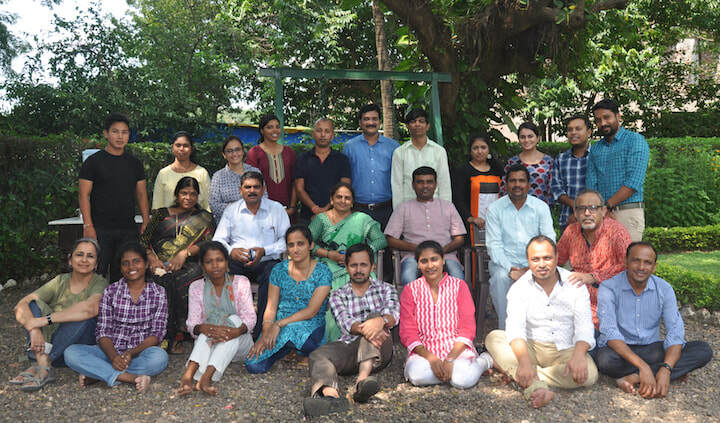 Participants of the workshop from September 26 to 30, 2018 at Leslie Sawhny Centre, Deolali, District Nashik, Maharashtra: Anju, Arvind, Avinasha, Bhaskar, Chhaya, Dinesh, Doel, Ganesha, Jyoti, Lakhyajit, Manash, Namit, Nandini, Naomi, Panchsheela, Poornesha, Pournima, Prabir, Pravin, Punjaji, Ramatai, Rituparna, Roshni, Ruqueya, and Snehal. The most important thing about this workshop was that there were no answers given. It was for us to draw our own conclusions and continue probing ourselves... Thanks for the eye opening sessions. Came thinking it would be six day paid holiday... but it was a disturbing process... From now on achcha achcha nahi sachcha sachcha bolunga (will speak what is right and not what others want to listen). The six day process was really very exciting, interesting and heart touching for me... Really participatory approach should first of all be practiced in our personal and daily life only then we will be able to go to the community and sit with them. Thank you so much! In this journey I found myself. I have come to know myself better. I know that the search for clarity is an going process and I want to remain alive through the process. I am going back with more questions than answers; but I have a feeling that the questions are making me richer than the answers. I am going back with a better/new perspective of looking at things. Uthal puthal karne ki himmat rakhnewalon ko mera salaam! (I salute the strength of the people who can create a turmoil).